We’re just a day away from one of the greatest times of the year, and we are reminded what a gift the Father has given us. We are reminded of the love Our Lord has for us: that He chose to come to us in human form, born to a young mother willing to accept the blessing the Lord gave her, and sacrificed Himself for us. We take that sacrificial love with us as we head out to abortion facilities around the globe, meeting mothers-in-crisis where they’re at, seeking to love them into a decision for LIFE. Whatever challenge a woman may be facing, we are there to stand in the gap, speak words of peace into her life, and let her know that her life and the life within her is precious. We remind her that we are with her, and God is with her. She is not alone. It is often that peaceful outreach presence on the sidewalk that is a game-changer: a simple conversation that brings hope to a woman who otherwise feels her life has just been turned upside down. Truly, when God’s people pray, show up, and allow the Holy Spirit to speak through them, hearts and minds are changed …and lives and souls are saved. And we praise God for the gift of YOU, our dear partners in this great mission! Thank you again for all of the prayers and support you give Sidewalk Advocates for Life as we seek to save lives, impact eternal souls, and end abortion through the power of His love! From our National Team — Lauren, Bethany, Susan, Christina, Dianna, Jenna, Nate, Dave & Jeff — as well as our Board of Directors — Juan, Elissa, Michael & Chris …have a very Merry Christmas and Happy New Year! While very recently visiting one of our locations in the Southeast, I accidentally gave the abortionist a Blessing Bag. Of course, looking back, I don’t think it was so much an “accident” as a divine seed the Lord wanted me to plant. Truly, the entire visit, I was reminded again how the Lord works in mysterious and wonderful ways when we answer His call, show up, and put our faith into action. Early Friday morning, I arrived to meet our local leader at the designated location. It was an empty building on a large lot which was across the street from the abortion facility. The owner had given us permission to park there. It was perfect and had ample space for the Stork Bus mobile ultrasound unit that would be arriving soon to receive any woman we sent their way for a life-saving sonogram! As I began to unload my supplies, I caught the distinct smell of propane gas. This was especially odd given the open-air environment. Then, I heard a hissing sound. The lot was beside a church badly in need of repair. At the far end of the lot sat a 500-gallon propane tank that was spewing propane into the air. I immediately alerted our local leader and called 911. The Stork Bus arrived, and we directed them safely down the street to a gas station, lest we lose a very expensive and vital tool to a fiery explosion! The 911 operator instructed us to leave our cars and evacuate the area until the Fire Department arrived. We quickly shifted our focus and started reaching out to the women beginning to arrive for their abortion appointments. Our local leader and I each positioned ourselves at one of the two entrances for the facility. A short time later, I saw a worker exit and approach our leader who was waving me over. As I walked over, I overheard the worker saying not to cross a certain spot on the pavement, that we could stand by the road all day long and get ourselves killed if we wanted to but not to cross the property line. With a big smile, I assured her we had no intention of trespassing and we would remain peaceful and law-abiding. Then, I said we would also be there to pray for or with her and that if she ever decided that she wanted to leave the industry …at which point she cut me off abruptly. The worker then stated she would NEVER quit because her mother had died 55 years earlier on a table, giving birth to a baby she had no business having, and she was making sure women had that choice. I immediately saw the pain she carried from this loss and how it had been a driving force for her. I remember telling her how sorry I was for what had happened and how much God loved her and that she deserved so much more. I asked her if I could give her a gift …and she happily accepted a worker Blessing Bag. I think I detected a little twinkle of happiness in her eyes. We said we would be praying for each other, and she returned inside. Once alone, our leader informed me that I had not just been speaking to a clinic worker…but to the abortionist herself! I had no idea! Our leader expressed her gratitude at being able to watch that interaction. She told me that what impressed her most was the genuine love she saw me give the worker. What a blessing that I got to have that exchange — the abortionist at that! — and give her a goody bag made with love, prayers, and information to And Then There Were None! Now, we know even better how to pray for this individual after she shared some of her personal story with us. Wow, God! By this time the Fire Department was finished and needed to speak with me since I had phoned in the emergency. The fireman said it was lucky I had discovered the leak: Apparently, someone had cut and stolen the copper pipe to sell for a little cash — and they could have killed themselves or others. I am so thankful it was resolved, and nobody was injured. The Stork Bus was able to return, and we continued to speak with women and provide life-saving information! Many divine appointments await us when we give our YES to His call. Just a little of our time and effort can produce miracles beyond our earthly understanding. We never know how God will use us when we are called to bring light to the darkness. Won’t you say YES today? Find a Sidewalk Advocates for Life location nearest you and get trained as a Sidewalk Advocate: sidewalkadvocates.org/location …or consider starting your own by going to sidewalkadvocates.org/apply! And if you can’t join us on the sidewalk, you can help this great work grow by signing up for a monthly gift of $25 or more at sidewalkadvocates.org/donate! Please join us in this great mission to save lives and end abortion through the power of His love! Reflection: Zacchaeus was a wealthy tax collector, a person rejected by the people due to the nature of his business. Jesus seeks out Zacchaeus as well as all sinners and the lost. There are times in my life when I was counted among the lost. We can take confidence in knowing Jesus is always seeking us out and all we have to do is open our hearts to Him. We are called to be Jesus to others, and in the same way He reached out to us, we should reach out to those who may be lost. We should especially reach out in any way we can to those who may be considering an abortion and to post-abortion women. In doing so, we allow Jesus to work through us in bringing the lost back to Him. Faith Challenge: Pray for all those who didn’t choose life or abortion workers, knowing Christ’s grace and abundant healing is available to anyone who asks for it. BREAKING: Abortion Worker #55 Leaves the Business!!!! I couldn’t wait to share this INCREDIBLE NEWS with you! Abortion worker #55 has just left the business at a Southeast abortion facility with the help and witness of local Sidewalk Advocates — to God be the Glory!! Love has won yet another worker over to Christ! In fact, And Then There Were Noneabortion worker ministry tells us that over 60% of the workers coming to them for help and healing got information from a Sidewalk Advocate! 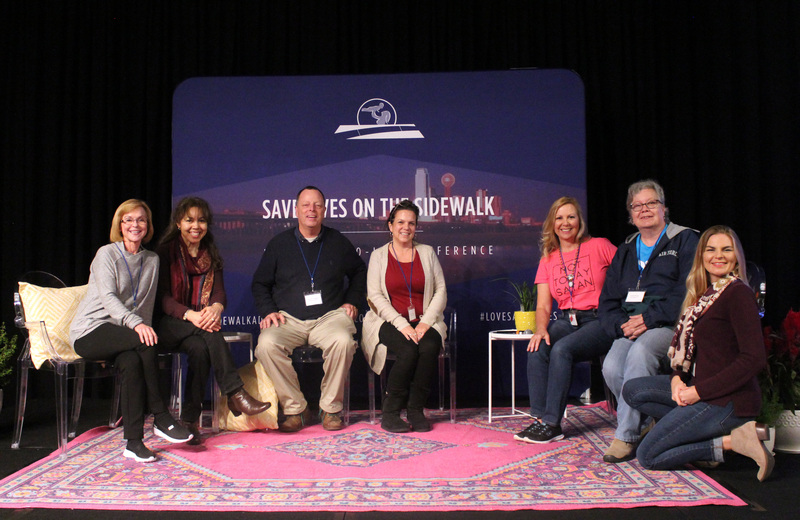 Friend, what God is doing is nothing short of amazing: Not only have 5,300 babies been saved from abortion, but we’ve had the privilege of helping 55 eternal souls leave the abortion business and find Christ. What a monumental victory!! Right now, we’re in the midst of our year-end financial campaign, there’s 5 DAYS TO GO, and we’re about $30,000 short …and in danger of losing our matching fund from a generous group of donors that we desperately need. If we don’t make goal, something will have to be cut from our life-saving program. Can you help with an emergency gift of $25, $100, $500, $1,000, $5,000 or more to get us closer to the finish line? Thank you so much ahead of time for your partnership in this great mission — we appreciate your support so much!